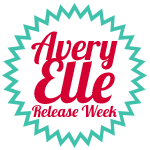 Back today with another Avery Elle new release! Today we're showcasing a set called Merry & Bright! Is it geeky to say that I love fonts? Something about finding the perfect font is so satisfying:) If you're a font or typography fan too, you'll love this set! Today I have 2 cards to share, one traditional and one a little more colorful! For this first card, I heat embossed the large type stamp in clear and covered it with deep dark red ink. You could heat emboss white onto red cardstock, but I find the blended ink to have a bit more warmth. For this second card, I heat embossed the same stamp again in clear and blended some neon green ink over it. I cropped the image under the Polaroid frame from Picture It. The rest of the sentiment is stamped in hot pink onto one of the flags from To the Point. I still wanted to keep it clean and white, but this card needed just a little something more. A little bit of flair from my pal Joscelyn Cutchens was the perfect thing! Thanks for stopping by today! Click on over to see more Merry & Bright projects from Jamie, Kasia, and Chunyuan! Don't forget, Jamie is offering the chance to win a $25 store credit! All the details are on the Avery Elle blog! The new release items will be available to purchase on November 5th on the Avery Elle site! Fabulous--I like the embossing and the wood grain on both. Love your ornament cards JJ, your design is amazing! 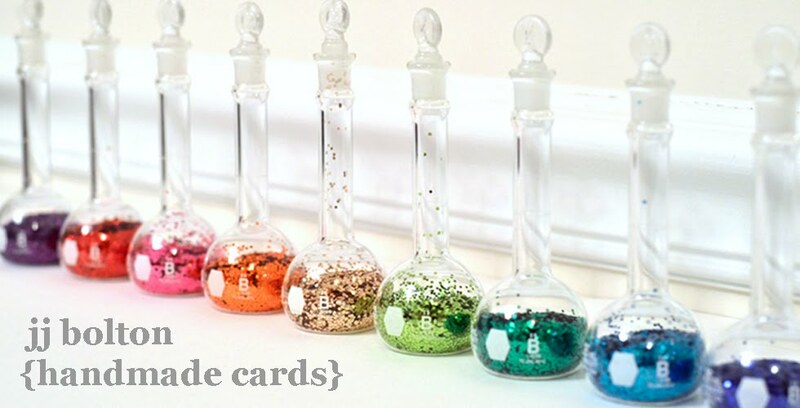 These cards are "Off the Chain" awesome!!! LOVE that wood grain! Must know where it is from! Beautiful and oh so trendy! JJ your cards are awesome! Love the woodgrain paper and all the neon and the FLAIR on the second one! Love your clear embossing with the red ink over it! And that tight woodgrain is fantastic! I've been looking for something on a smaller scale like that. Wow, really cool cards...where did you get the wood grain embossing folder....? both are awesome. Love the neon on the second one. 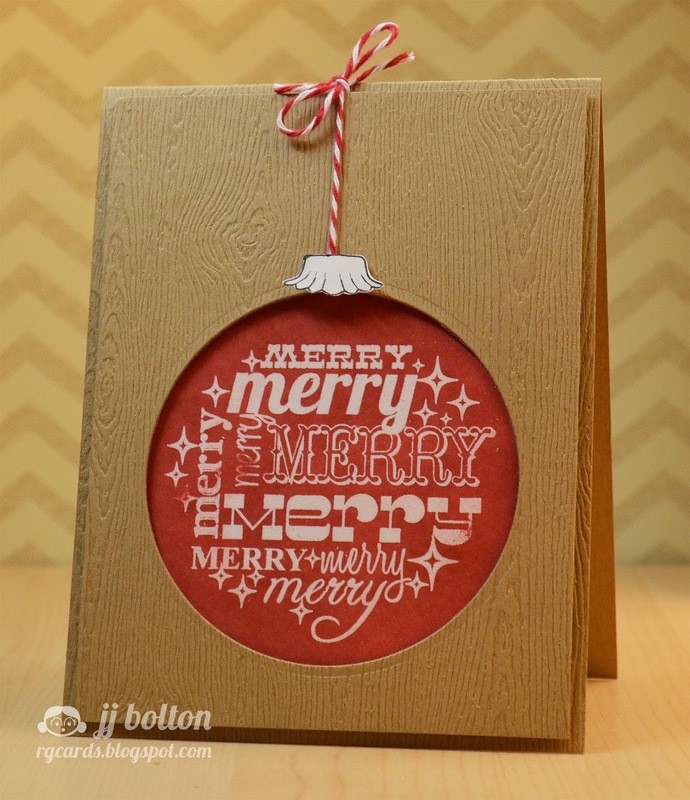 Love the red ornament with the woodgrain, great masculine card. I'm with everyone, where's the woodgrain from? Great cards! 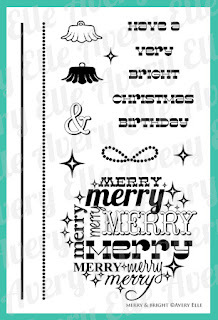 Love the Merry and Bright set! Love how you fit the round sentiment behind a square opening--so cool! And that is a yummy woodgrain! Whoa - yeah it is. M & B.
I never thought about it before, but you're totally right - the inking DOES have more warmth to it. I must give this technique a try with the framing...I love it :) And the funky neon green? Too cool & fun! That wood grain is a real stand out on both of these!! It is so clean and really draws your eye to the sentiments! And wow what a contrast between the two - the first looks so classic and traditional and the second so modern and fresh!